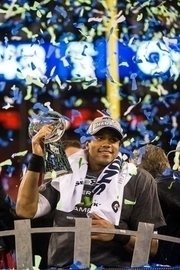 Like people all over the country and the world, I'm celebrating today and cheering the Seahawks through the Super Bowl. Seahawk fans are "All In" and know that the results that their team realizes today is not a one-day thing. Their accomplishments are possible because of the journey that began months and months earlier. For some, it's been a journey measured in years. Anything good takes commitment, patience, and effort. Today, I'm enjoying my family in Utah and we'll have all the traditional Super Bowl calories on the table - everything from BBQ ribs to Skittles. And I know I'm going to partake. It's what we do. But I also know that I'm committed to being healthy and losing weight. I've already been out to for a morning walk through the ice cold streets and will do my best to limit the intake quantities. January was a good month. I lost weight, increased exercise, and tracked the food and water that I consumed. I feel like I'm heading in the right direction. Now "Go Seahawks!" Let's hoist the Lombardi Trophy with pride. You've earned it! I hope to hoist a scale or something symbolic of my weight loss one day too! January results compared to goals. Sleep: 6 hours per day (or more) -Accomplished! - Averaged 6 hrs and 6 min per nt.